They speak to who you are as a person. Keep you warm. Allow you to be in public without getting arrested. And sometimes they connect you to the Internet. 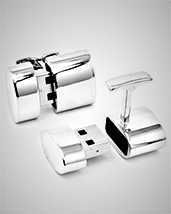 Behold the double agent-y ridiculousness of Wi-Fi Cufflinks, just a pair of silver sleeve fasteners that happen to double as Internet hotspots (yes, they totally stole your idea), available now. Think of it this way: James Bond had a cigarette capable of shooting jet-powered mini rockets, you have this. Only instead of killing guards outside of random volcano lairs, you’ll be... tweeting. On the outside, they look like normal cufflinks. Polished silver ones worthy of any button-down in your closet. But just beneath the surface, hidden in plain sight, is a pair of full-on USB hotspots that feed off your existing Internet service to give wi-fi love to iPhones, iPads or any other device you may want to breathe Internet life into (who cares if there’s Internet everywhere... Bond cufflinks). Once you slip one of these in the USB port of your main computer, all that’s left to do is roll up your now-open sleeve and go about the rest of your day.